The National 4-H History Preservation Leadership Team introduced a self-guided history tour of the National 4-H Youth Conference Center during National 4-H Conference this past spring. This is the first step of a planned Center-wide tour to cover many places of interest and items of National 4-H Historical value at the Center, and was conducted in the lobby area of J. C. Penney Hall. Six sites were picked because of their proximity and because they include the history from the day that the National 4-H Center was opened by President Eisenhower up to and including an exhibit of national artifacts from the 10 most recent years of 4-H history. People wishing to take the tour need only a scanning device such as a smart phone or an electronic tablet to participate. Each item on the tour includes a marker containing a very brief description of the historical area or artifact and a QR code which leads the viewers to more detailed information. To make the experience more enticing and rewarding for the Conference visitors, the History Team devised a treasure hunt. Conference delegates were given a map designating the areas where the QR codes were located along with a question to be answered on each place, item or the person featured in that part of 4-H History. The participants needed to read a small amount of information on their device in order to answer the questions. To make the experience more gratifying, the 4-H Center Gift Shop offered a 10% discount to all who found the answers to all six questions. 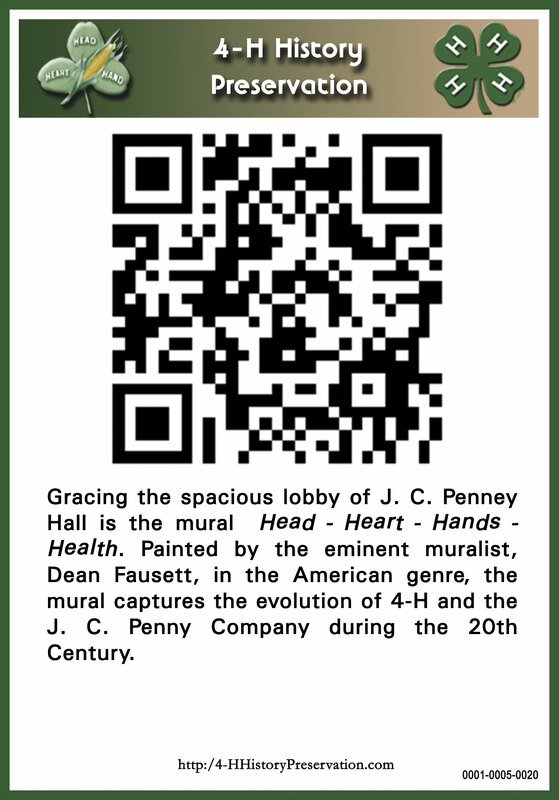 The areas/items currently on the tour are: Gertrude Warren’s Portrait, the J. C. Penney Mural, the Contemporary 4-H Exhibit, Massachusetts Foyer, Noble Breakfront and Danforth Courtyard. The History Team hopes to enlarge the tour to include the timeline mural and historic items in J. C. Penney Hall’s first floor Kathleen’s Corner along with the artwork in the Heritage Hallway between Aiton Auditorium and the Schruben Board Room on the lower level as the project moves forward over the coming months. 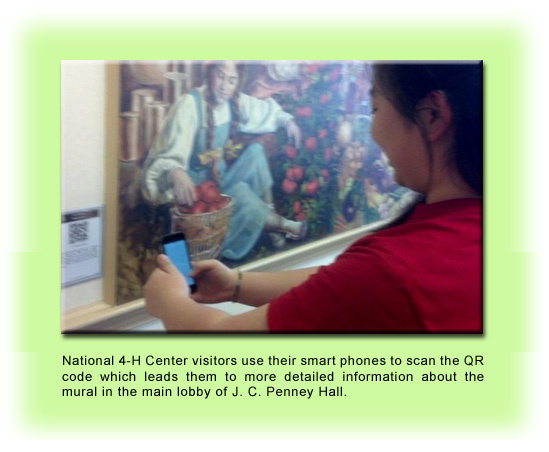 This entry was posted in History and tagged 4-H History, 4-H QR Program, Self-Guided 4-H History Tour by Larry Krug. Bookmark the permalink.